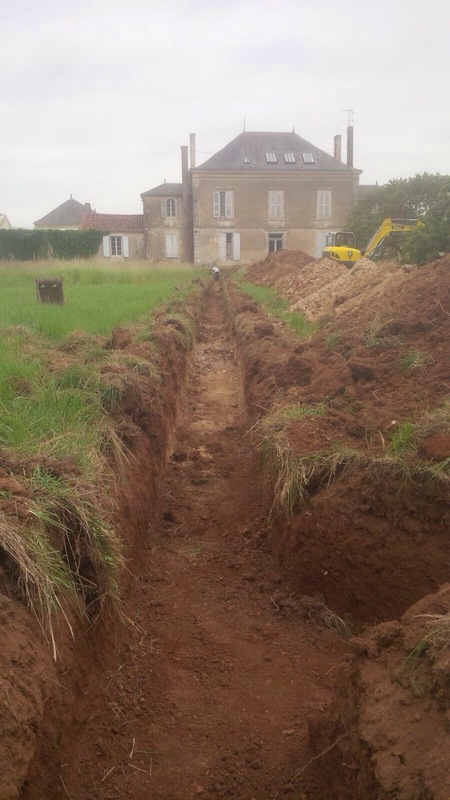 The trench from the water pump to the house. Yes, it was as cold as it looks. The entry hall with tile removed. To the right, that dark spot is where the salon floor was completely open to the basement. 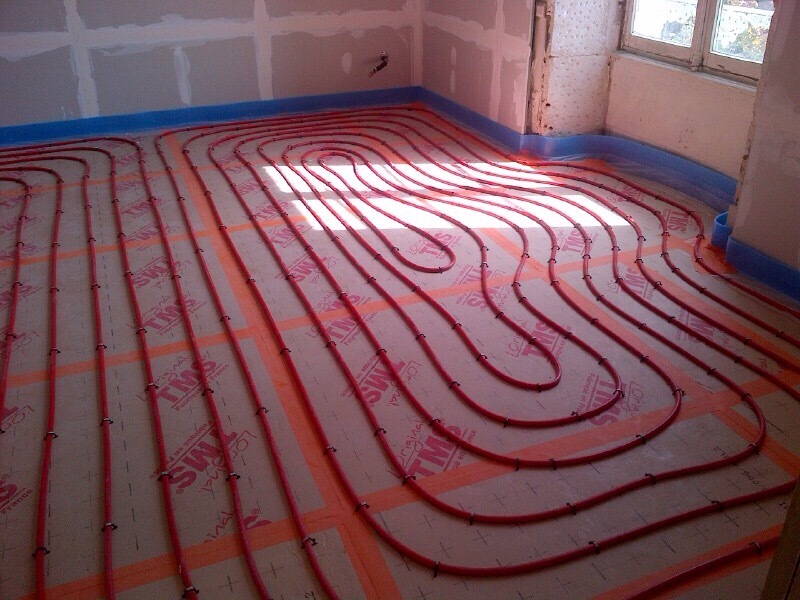 View of floor heating cables in salon. The previous floor — mostly post-war tile, not at all sympathetic to the house — was demolished, so that the new finish floor would be at the original level. Last week we transitioned from camping in a construction site to living in a house. It took an insanely long time and cost double what I thought was a generous budget, but for all practical purposes, the house itself is finally done. The reason is simple. The heat went on. I will recap for those who tuned in late. About three years ago I fell hard for a house that looked like the houses I used to draw in preschool. I was reeling from the death of my adored husband. The only things that were clear was that I had to get out of the old house and I had to find a place where I could be safe. What could be safer than a child’s dream house? The thing is, since preschool I had studied architecture and historic preservation. I knew that too many people lived in houses like this but really only occupied the kitchen and bedroom, simply because they couldn’t afford to heat the rest. I knew I was in crazy widow mode but wanted, if at all possible, to shift that to crazy like a fox. I spent a lot of time with Google and YouTube, researching options, and came up with an aquathermal heat exchange system: expensive to install but dirt cheap to run. Thus the abundance of process piping. At the time it seemed so simple. 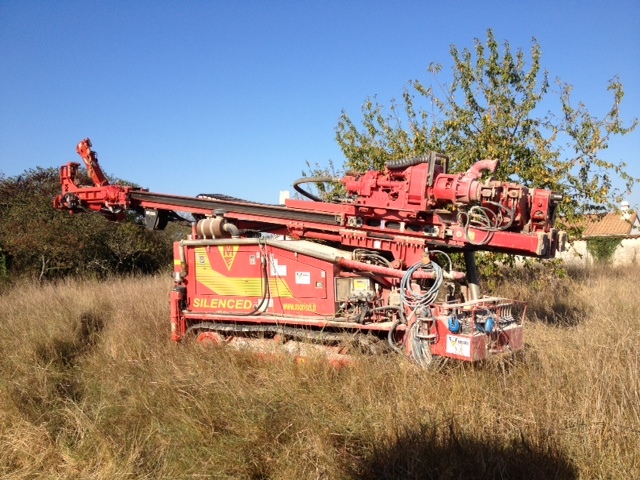 So a hole 70 meters deep was drilled to reach the ground water in my back garden. That first picture shows the enclosure where it pops up. Then they removed a huge tank, still half full of old, cruddy fuel oil, from the basement and in its place installed the pipes you see in the final photo but did not turn on the lights. Believe me, the lights are crucial. Every radiator was removed to be cleaned. The ground floor finish floor was ripped up — the few remaining planks of original wooden floor had warped and buckled beyond salvage before I bought the house and the tile, which covered most of the rest, was half a century old and not nice at all. 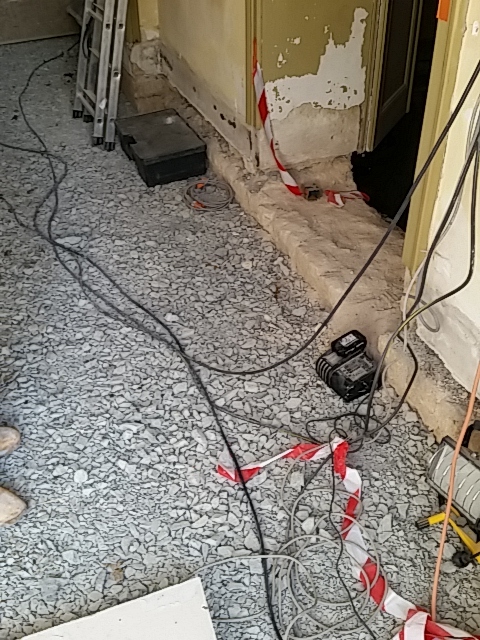 In its place we put heating cables which we covered with stone tiles. The cleaned and painted radiators were replaced upstairs. I would like to have turned on the heat right then, but no. It turns out that most houses have monophase power but houses with setups like this need triphase power. Who knew? Probably not my electricians, who let the ball drop on that, so we lost about six months while I fought with the electricians and we finally got EDF to change the electric meter. Lucky for me that triphase power — no, I don’t actually know how that works — was available in the street or we might have lost a year. And finally, about three years to the day after I signed the agreement to buy the house, two capable young men appeared and spent several hours calibrating the whole thing. Just like that, the house became warm. So what do I think? The best thing is that the stone floor is warm, now. I would not want a stone or tile floor in a cold climate without the underfloor cables, though I believe there are underfloor heating mats you can buy, if you don’t want to go to all this trouble. Supposedly the heated floor will act as a vapor barrier, so I won’t have to worry about rising damp, frozen pipes and various other ills that befall stone houses. It took a few days for the heat to penetrate the house. Now we are shutting down or shutting off radiators because the house has become too warm. It may be that the stone floor will be almost enough to heat the whole house. We turned down the thermostat. So balancing this system is a work in progress but the bottom line is that it seems to be using less power than expected. As a side benefit, the system operates the water heaters, too. I do not yet know what the operating cost will be. I was told it had a ten-year payback period. This explains why developers stay away from such systems; it is not the kind of thing most people will pay extra for. I gambled that I would live ten more years, still be in the house that long and that power costs would increase, thus reducing my payback period. I believe it is good for the planet, as it is a nonpolluting heat source. 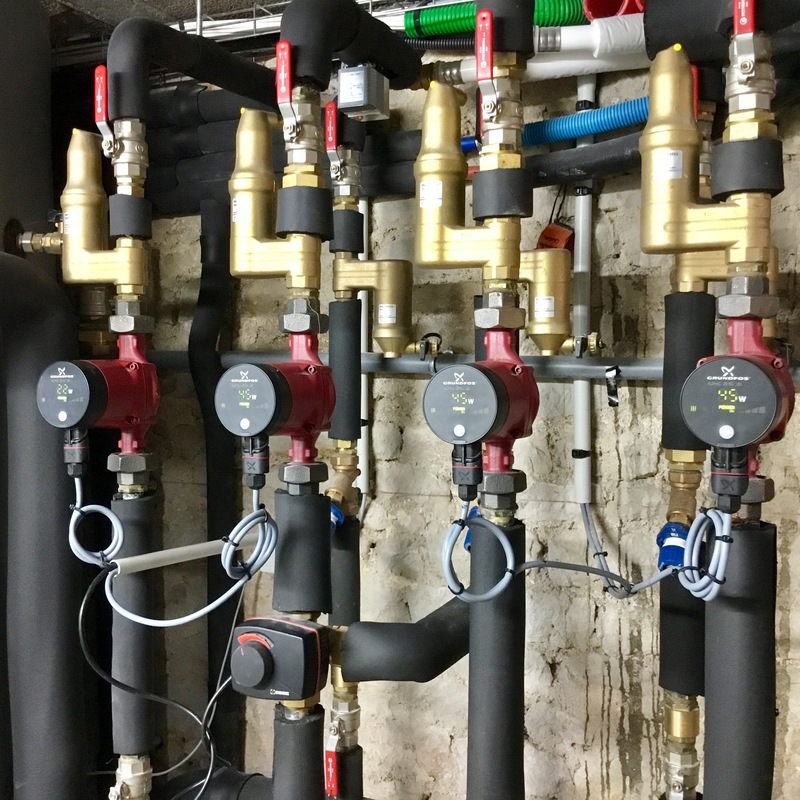 Ground water is piped into the heat extractor and, without ever leaving the pipes, the magic happens and the water is piped back to the source. It enables me to occupy my entire house, which I love. Plus, if the house does stay mildew-free, if it does eliminate spalling on the exterior, that’s all good and saves even more money. So that’s heating sorted. Now I’m hoping solar panels and wind turbines become more efficient, so I can move onto power generation. I’m feeling your joy; I can imagine what a milestone this was. It was appalling. The electrical contractor, complain as I do about him, at least brought the job in at roughly the original cost. The exclusions in the main contractor’s pricing, plus the lack of clarity in the design drawings, were absolute budget killers. I have heard other horror stories re exclusions. I think we have been very fortunate that none of our contractors played that game. Who did the design drawings? A local architect. He claimed to know about low-energy design, when in fact he just knew the number of a contractor who knew. He claimed to be able to handle construction management — my old job, but for well into this process I was still pretty fragile — when in fact he just rubber-stamped everything that happened. He did a great set of permit drawings, no question, but he did nothing to develop or detail those drawings. His excuse was that “clients change their mind,” so there was no point. My argument that he should do it anyway went nowhere. So to be fair to my contractor, there was no game. He gave a price to the extent that he could estimate one. With no drawings and no specifications, it would be difficult to do more than that. The trouble is, none of this was explained until too late. And in fact, once I bought the house, I was doomed. There was no way to do less, other than live in a slate-roofed tent for years on end. Yes, once committed you have to follow through. Sounds like the architect didn’t care enough. Anyhow, its nearly there now, you can walk around in bare feet and you love it ..
That’s a worthwhile investment! There is nothing like a warm house in winter and it will – should the day ever come – be a good selling point. A pity about the three phase glitch, though: all the houses we had came with three phase having had some associated agri/viticultural use in a previous life – except the ones which had nothing at all. Too true! They gave us an estimate. Then it turned out they did less work than they had estimated, so they changed the prices on the final bill to fit the estimate. How do you fight that sort of thing? In fact the property had been used to raise pigs and did have three-phase electricity — everywhere except at the meter, which had been replaced at some point. So all they had to do was change the meter. I was quite lucky. All the things no one mentions in the books and articles about buying a house in rural France…. A friend of mine had that heating system installed here in Switzerland about ten years ago – no regrets, and her house is always cosy and warm even when it’s -10° C outside. A wise choice. So far, I love it. The floor acts as a sort of huge radiator. The motivation was to lower my monthly bills. I am so happy with the way my house is heated that lower bills just feel like a bonus. My brother has geothermal heating (and A/C) and loves it. Not quite the same because his goes through typical American forced-air ducts. Underfloor heating like yours is supposed to be the most energy efficient option. I suppose you have a heat pump that brings the ground-temp water (around 50 F) to a higher temperature. This is what we have, though it only runs through radiators and doesn’t have the geothermal component. Heat pumps are very efficient until you get down around the 20s F, so for us that’s perfect. The last time it hit the 20s here was six years ago, for a week. Most of the winter stays above freezing. We cut our heat bill by 75% from the previous propane furnace. Ooh, 75%. The cost overruns were such that I’m having to sharpen my pencil a bit to give my finances time to recover. That will help a lot. What fantastic news. Happy Thanksgiving! Yes, it’s today! Thanks and happy Thanksgiving to you, as well. I stopped celebrating Thanksgiving. I should get back to that. Congrats on having the benefit of warm feet in the midst of cold! System sounds wonderful! Enjoy. Even though you are in France, Happy Thanksgiving! The expats here have a few good options for Thanksgiving. Next year, I’ll have to get back to choosing one of them. A French Thanksgiving dinner is a very pleasant thing. Interesting. 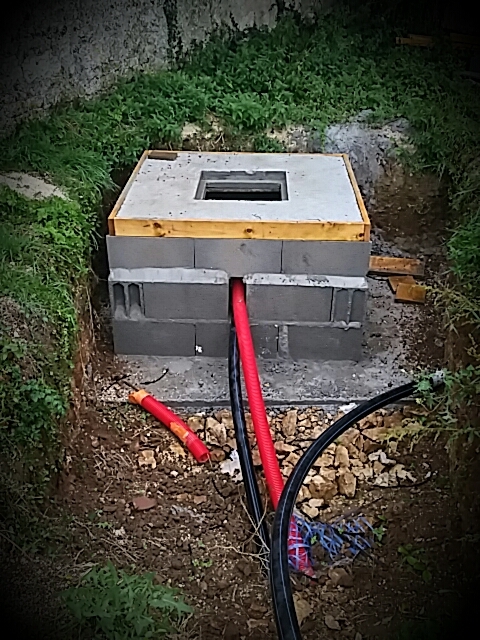 The little house in Marcolès will have underfloor heating in part and electric hot-water vintage radiators. My son in law is a plumber with a very high end business in South West London. He would love us to have ground-source but we can’t do it because of the need for external work …. it’s complicated (note to self – don’t by another historic monument). We do however want to pursue the idea for our forever home (if we ever find it) …. this was another really interesting piece and I can positively here the soulagement springing from the page! Yes, the ground-source thing was a big deal, mainly because the water that was closest to the surface was pretty far from the house. This not being your forever house, I think you should wait, in any case, just because it was expensive: well into five figures. You want to be sure you’re going to be around for every bit of that payback period. As far as it being a historic monument, unless you have fuddy bureaucrats nipping at your heels — and I understand the Monuments Historiques guys nip like no other — I wouldn’t worry about that. I undergrounded all the utilities. That box that is so ugly in the photo is now underground. Apart from the EDF-required electric supply cables snaking up the wall right next to the entry, my house looks very 1860, the year it was built. Inside, too, where they probably used the fireplaces for heating, it is quite nice to have the main ground floor rooms radiator-free. As long as you are not wondering where the fireplaces went, it has a lovely 19th-century feel to it. Listen, there is a chateau near me that is for sale. If your budget will stretch to a chateau — outside gorgeous, inside, people say it needs a lot of work — this one is lovely and on a huge piece of property set back from the main street. It’s worth a visit. SO Marcolès is a forever house but not the one that we will live in all the time. It was a whim to buy it as a maison secondaire and we won’t sell it …. the story that goes with it (that forms the book I am writing at the moment) gives clues to our madness. In terms of groundsource there it is not simply a matter of it being a MH nor that the town see it as the emblem of their tiny walled city but also that we own literally only the house and the ground it stands on. It comes with absolutely zero terrain and the surrounds are medieval and cobbled so really it would not be worth the headache. Add to that the small size of it 100m2 over three floors and really a poêle and underfloor on the ground floor and electrically fed rads on the uppers are all it will need. We will be back in France from mid-December for a while … if you want to send me coordinates for the chateau to my email osyth.storyteller@gmail.com we might be interested in the place you speak of though my husband is quite stubbornly wed to Cantal …. Next Post What was that about old age and treachery?